To avoid you parking being canceled if you send some coins from the address which is linked to the bank or sending the coins within your wallet, you should know the following. All crypto wallets tend to send the coins from any address they find the coins at, so to avoid any parking cancellations you should be extremely careful and show the wallet where to take coins for sending. This is what this post is about. To avoid getting your parking canceled, you must be extremely careful with the coins located at the address which is linked to the bank. The number of coins must not become less than it was when the parking has been created. 1. 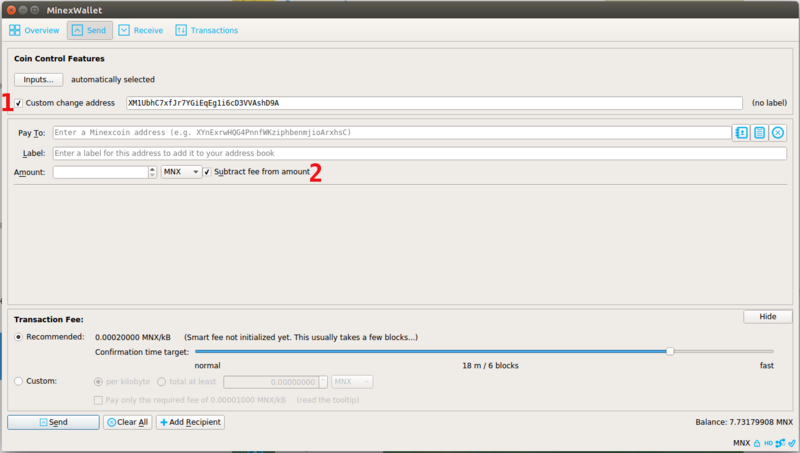 Click Inputs button in Send menu and chose the address to send the coins from. 2. Always designate change address as the address linked to the bank: tick Custom change address check box and paste the address which is linked to the bank. Note that you do not have to put a Change address if you do not send coins from the address linked to the bank. This step is needed if you send the coins from the address linked to the bank. More about change can be found at What is the “change” in my wallet? Where does it go? 3. Commission fee: tick Subtract fee from amount check box. This way the fee will be subtracted from the amount you are sending and will not affect the parked coins. NOTE: We strongly recommend you also to use Сoin control feature if you send any coins within your wallet because crypto wallets take coins from ANY address inside them to make transaction unless you designate the address. If this is the case, there is a probability that the wallet would take the coins from the address which had parked coins so the parking will be canceled automatically due to an insufficient number of coins.